Heavy Commercial Steam Cleaner + Soap Injection! 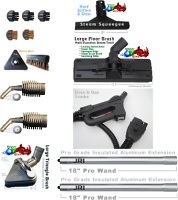 Included is the Viper Hot vapor steam cleaner and accessories. Featuring a dual tank continuous fill (easy refill) boiler system, 5 bars / 72.5 PSI, high quality accessories and an on demand, gun activated Dry vapor steam cleaner mod + hot detergent / hot soap + hot water injection system (DUAL INJECTION!) all for one remarkable low price. Guaranteed lowest price! Ultra Portable and ready when you are. Free Shipping inside the lower 48 US States. 96% Dry Vapor Steam Hot Water Injection Hot Detergent Injection High Power 1,800 Watts Low Water Usage, 1 GPH! Indoor Safe! Vapor Rino is constantly trying to improve and grow to meet our customers needs. New with the Viper Hot Auto Wash is the ability to switch between hot water injection and chemical injection without having to empty your chemical jug! You see, in the past if you were using hot water injection and wanted to switch to chemical or soap injection you had to empty the injector tank (seen on back right of unit) and fill it with soap when you wanted to use it. This is how the 5000-Ci or VS900-C works. The Viper is breaking ground with this new technology! You see, you can have your soap loaded and ready to use. Simply push a button and it comes out mingled with the steam flow. A powerful tool. By the way, just in case you didn't know, this unit also puts out 95% dry vapor steam as well! When you want hot water, you simply push a button on the machine and you get hot water mingled with the steam. This hot water comes from the boiler for instant access to super heated water injection any time you want it. You can also fill the chemical tank with simple tap water. This method allows you to use hot water injection without taking from your boiler. Great for washing cars and much more. No matter how you slice it, this is a POWERFUL upgrade. 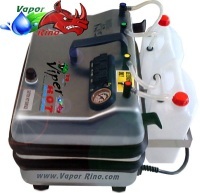 We here at Vapor Rino are proud to offer you this dual injection system, continuous fill, commercial dry vapor steam cleaner. To top it off we are offering it at an unheard of price for such power & technology! POWER, QUALITY and VALUE all in one unit. Italian made, first world craftsmanship. Quick Overview: The Viper Hot Auto Wash is an amazing high powered, compact piece of commercial Steam Cleaner technology. Weighing in at only 25 lbs it is ultra portable. Perfect for the mobile detailer or cleaning contractor. Boasting a full 1,800 Watts with chemical injection. This is NO ordinary steam cleaner! It combines the hot water injection feature of the VC 4000-C with the external tank chemical injection feature of the VC 5000-Ci. 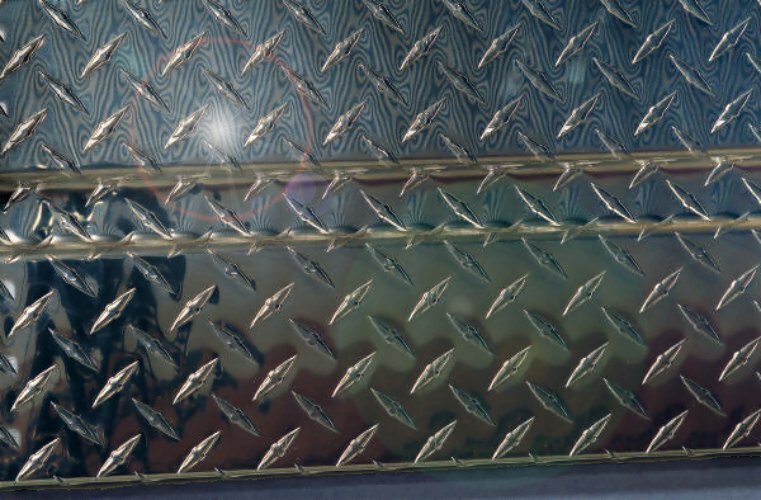 Notice the two white colored bottles (see pictures) on the back of the unit. The one on the left is your boiler refill (fill with distilled water) and the one on the right is your chemical or soap injection tank. This soap tank can be filled with either detergent or simple tap water for rinsing. Now here is where it gets interesting. Lets say you have soap in the one tank and want to rinse it off with hot water. Simply hit a switch on the steamer and pull the trigger and you get instant hot water injection WITHOUT Changing out the chemical tank. This water comes from the boiler so use it sparingly. This is a real paradigm change for the vapor steam cleaner industry. Steam and hot water are both very powerful cleaning tools, but when you add a few drops of detergent it can make a very big difference in a variety of cleaning applications. Some common applications are greasy commercial kitchen cleaning, (Note, simple low cost Dawn liquid dish detergent diluted with water works great!) bubble gum removal, sticker removal, commercial bathroom cleaning, floor grout cleaning, auto detail cleaning, dry steam car washing, application of zip wax after car wash and much more. This Chemical injection systems makes it a true industry specific capable, Industrial Steam Cleaner. Included Features: The Viper Hot Auto Wash is truly Maximum Power. Boasting 1800 Watts, it is literally MAXIMUM Power for a standard 120v 15amp outlet. When you want the "juice" you want the Viper! Fully loaded with all the accessories you see above and the included chemical injection system, it comes ready to work right out of the box! Note that all accessories are replaceable and can be ordered here. Features: Powerful 72.5 PSI Maximum output 96% Dry Vapor Steam Cleaner output using 1000 times less water then a pressure washer! 100% indoor safe it only uses about one gallon of water per hour in dry steam mode. Hot Detergent / Chemical Injection On Demand! This feature allows you to inject super heated detergent / soap mix in a spattering pattern to help break up grease and grime fast. The best part it is activated right in the steam gun handle making for instant and easy use. Hot Water Injection On Demand! You can pull super heated water directly from your boiler system or simply fill your chemical tank with tap water instead of detergent. Doing it this way allows you to do extend rinsing without taking water from your boiler. Hot water injection allows you to inject heated water mingled with steam in a spattering pattern to help rinse away or break up grime. The best part about this commercial steam cleaner's injection feature is that its activated right in the steam gun handle making for instant and easy use. 100% Adjustable steam flow! Just turn the knob right or left to control how fast the steam comes out. From antiques and detail work to tile and grout cleaning and auto-detail work the Viper Hot Auto Wash Commercial Steam Cleaner has you covered. Lets not forget about its amazing, cool touch, non pressurized easy refill cap! This dual tank system allows you to add water to the refill tank while your working! This means you will never turn off & cool down your system just to refill it! Continuous operation means more time on the job. Common Uses For This Vapor Steam Cleaner: The Viper Hot Auto Wash Commercial Vapor Steam Cleaner is a fantastic cleaning system for commercial kitchens, automotive detailing, dry car washing, hotels, Air Conditioner fins, heating coils, facility sanitation, bedbug removal, floor grout cleaning, hard floor mopping including hardwood, linoleum and tile. It's chemical injection system makes it great for cleaning greasy deep fryers, cooking equipment, sinks, toilets, urinals, detail cleaning in factories, printing facilities, pet shops, hospitals, doctors offices, animal clinics, auto mechanic shops, even jewelers and dentists can benefit from this amazingly versatile cleaning technology. 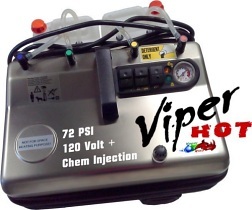 The Viper Hot's chemical injection & hot water injecton system takes this vapor steam cleaner to a whole new level. Mobile Car / Automotive Detailing & Dry Carwash Industry: Dry vapor steam cleaner are absolutely taking over the automotive detailing industry and for good reason too! Most auto detailers that try steam frankly go nuts for it. We constantly here our buyers saying things like "man, I just can't imagine how I ever worked without one" or "there is no question, I will ALWAYS have one of these for my detailing business" or "man, these things are awesome detailers" or "this really worked out well, send me another for my guys". There is no shortage of enthusiasm for how remarkably well these machines perform in the detail industry. After all, dry vapor steam cleaners are the perfect detail cleaning tool be it antiques, machine parts or cup holders, seat bolts, dash boards and frankly just about the whole car. Don't forget the detergent injection system. It allows you to apply cleaning fluids, car soap and more. If you are an auto detailing technician and don't have a vapor steam cleaner you are simply missing out. They save you time, money and do a far better job then past methods. They allow you to clean faster and deeper while at the same time killing odor causing bacteria, viruses, germs, mold and mildew as well as kill flees, lice, bedbugs and dust mites all during the course of normal use! Oh yeah,, did I mention it is amazing on car leather seats? Now available HORSE HAIR Brushes for delicate detailing work. Check out our leather seat cleaning video here. So how about the outside of the car? The "Dry Carwash" industry is exploding across the globe. All over the world the UN's agenda 21 is pushing for tighter and tighter water restrictions. This INCLUDES inside the US. Like it or not, agree or not one city after the other is passing water usage restrictions regardless of the amount of rain we get. Coming to a city near you. Frankly, we should restrict this out of control government power grab but that is another discussion. With the Viper Hot Auto Wash you can actually wash the entire outside of a car without even one drop of water hitting the ground. This means ZERO water waist and NO runoff! This allows you to run your mobile carwash inside of a dealership, parking garage or on the street even during a drought. It uses as little as 1 gallon of water per hour of steaming, uses no fuel, has zero emissions and has a whisper quiet steam generator making the Viper Hot Commercial Steam Cleaner a truly environmentally friendly vapor steam cleaning machine. By the way, add some wash and wax soap to the chemical tank and you now have a soapy mobile carwash. This vapor steam cleaner does it all,,, well almost. It is not a vacuum or extractor! But we all have one of those already right? So here it is. One of the lowest priced FULL feature vapor steam cleaners available anywhere. Check out our dry car wash section for more information on this topic and watch our dry car washing videos. 30 DAYS BEST PRICE GUARANTEE! FREE Shipping Inside the lower 48 States! 800-490-1886 Or Order Instantly Now! * All items are fully covered by the manufacturer warrantee. All units are factory new and tested before shipment. Orders are not refundable. All sales are final. More On The Lifetime Warranty OR Our Policies OR Q&A. Shipping: Items usually ship out within 1 to 2 business days, typically expect from 5 to 7 days from that. Express shipping is available at checkout. Perfect For The Professional That Want Portable Industrial Steam Cleaner Power & Professional Results! Mobile Auto Detailer Car Wash Systems! . 3 Way Steam Pressure Washers. Rate Our Site! Help Us Improve! I love my steamer! I use it EVERY DAY! I have told all of my friends about it and convinced 4 to order it. They also love it. All I had to do was show them mine working and they were sold. Boing Air, contractors, restaurants, Major Hotels, Auto Detail Shops & many more! * OUR RESUME: See a list of companies using our industrial steam cleaners systems here. JRI NOTE: This customer is responsible for over 30 steam cleaner sales in 18 months all in Peoria, AZ. This woman does not get paid for this! All this by word of mouth. Wow! Thank you Maylon! Our vapor steam cleaners are truly fantastic machines. Output Mode #3: Hot Water Injection into the Steam Flow - Fully Adjustable Injection Flow Perfect for rinsing & cleaning many surfaces. NEW: Draw water from the chemical jug or directly from the boiler! Gun Activation: Both Steam and Injection Features are easily Activated from the Steam Gun for on demand use! Heating Time: Approximately 20 minutes from cold to ready to steam. Internal Boiler Temperature: Over 300 Degrees F.
Simply Click a video below to Watch! the hatch on the front right where the hose plugs in. Hose & Gun Included! Beautiful Sleek Design. Unit is on wheels! Quality Commercial & Industrial Steam Cleaner Systems Easy Fingertip Controls! in action Ever want to wash a car indoors? Well now you can! 100% Mobile. Wash cars even during most water restrictions. Use as little as 1 gallon per hour! Linoleum, Tile and more (See Video) Great Janitorial Commercial Steam Cleaner Results. Perfect for floor grout cleaning, kitchens, restrooms & much more! 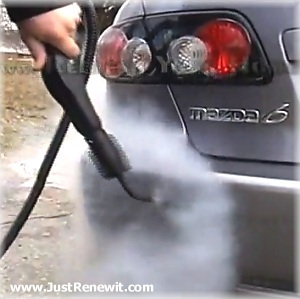 What's Included With Your Viper Hot Auto Wash Steam Cleaner? Everything you see in the images below is included & more! The Full, Ready to Work Professional steam cleaner Accessory Kit show here! Two 1" detail brushes in HORSE HAIR for delicate surfaces. One approximately 3" Medium triangle HORSE HAIR brush for medium surfaces. One window steam squeegee. Great for glass, mirrors, smooth surfaces like stainless steel, ceramic & more. Two heavy duty insulated, stand & clean professional grade, light weight aluminum extension poles. 18" each. 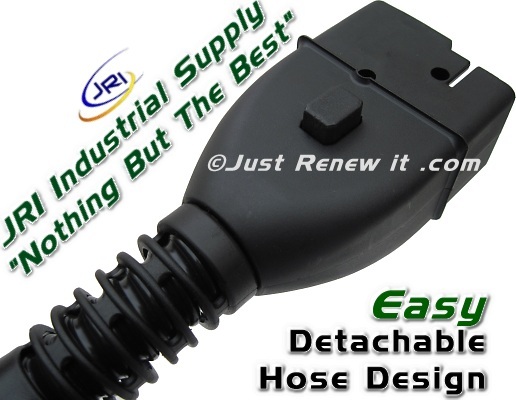 One 12 foot extra long insulated, detachable industrial steam cleaner steam hose. Advanced Steam Control Gun built into steam hose. Allows you to activate hot water injection and/or steam with easy finger tip controls! Large heavy duty triangle jetted brush & and hand held steam mop with lockable swivel head and mounted towel clips. Large heavy duty 11+ inch multi use steam mop head with swivel lockable head and mounted towel clips. Mobile Auto Detailer Car Wash Systems! Dependable Commercial Steam Cleaner Technology! 30 Day Guaranteed Lowest Price! Powerful Commercial Steam Cleaner Technology! Powerful Innovative Industrial Steam Cleaner Technology!